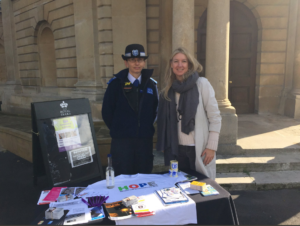 Andrea Newman is Community Engagement Officer at Restore:London, our pan London Restorative Justice Service. Becoming the Community Engagement Coordinator for Restore:London in May this year was a gift. I had come from a background in the Criminal Justice System, having been a magistrate for 17 years. I was familiar with the victims’ (often terrible) experience within the system. In my last few years on the bench, I became increasingly concerned by the absence of victims’ voices. Victims often didn’t have a Victim Impact Statement and throughout the process the emphasis was on ‘fact not feeling’. The Courts are an intimidating environment, the language and process can be confusing and sometimes brutal. So part of my work with Restore:London has been to convince the Magistracy that a restorative justice presence is needed in the courts and that victims must have access to information about it. We also attended the annual magistrate’s training event where we met with several judges and many, many magistrates who were overwhelmingly supportive of and interested in restorative justice. Magistrates asked about training to become practitioners and Judges offered support and suggestions about using restorative justice as part of a sentence. Inspired thinking indeed! We’ve also been working with the Metropolitan Police. We spent many days commuting to Enfield and Barkingside to deliver restorative justice awareness sessions to officers. It was during session three that I worked out the key to the success of our presentation. We asked them how many of them had been a victim of crime or if they hadn’t, if a family member or friend had been. This resulted in usually two thirds of a room full of officers putting up their hands. There was a notable shift in the room as officer’s looked at one another as they shared their vulnerability and stories of harm. It made our job so much easier, there was trust, a lot less cynicism and a shift in judging what they thought victims’ needs were and, more importantly, the limitations of offenders. From January we will be running restorative justice awareness sessions for every officer in the new Tri Borough that covers Kensington & Chelsea, Fulham & Hammesmith and Westminster- a total of 2,500 officers! What I have found is the importance of asking the question: “Have you ever been a victim of Crime?” I’ve had many conversations with members of the public who just seemed relieved to tell their story. They may or may not engage with the service but they have been listened to and information has been passed on. During the past six months, I’ve never left a meeting without people understanding what RJ is and changing the doubters into believers! There is no great mystery to this, we have to work with conviction, be authentic and always have time to stop and speak to people and ask them how they are. Harm is all too often invisible, but we all know it is there. What I will emphasize is the importance of our work that we don’t stop until every person harmed in the UK has access to restorative justice. We are fortunate enough to be part of a global movement. A movement for resolving conflict, improving relationships and healing communities. We all believe in what restorative justice can achieve and we want our service, and those like it, to grow and for all victims to have access. Be that from the police, the courts, their place of worship, dropping into a “pop-up” restorative justice clinic, their GP’s practice, library or community centre. So, let’s use International Restorative Justice Week to reach out to all victims. Let’s use the week as a talking point to ask a friend, family member or stranger “Have you ever been a victim of crime”? Hopefully the answer will be No, but if it is Yes, you know where we are and we know what to do. Catch22 deliver restorative justice across our victims services, learn about them here.